Guru Tegh Bahadur (Punjabi: ਗੁਰੂ ਤੇਗ਼ ਬਹਾਦਰ, Punjabi pronunciation: [ɡʊru teɣ bəhɑdʊɾ]; 1 April 1621 – 11 November 1675), revered as the ninth Nanak, was the ninth of ten Gurus (Prophets) of the Sikh religion. Guru Teg Bahadur carried forward the light of Guru Nanak’s sanctity and divinity, and his spiritual revelations are registered in the form of 115 poetic hymns in the eternal Guru of Sikhs, Guru Granth Sahib. 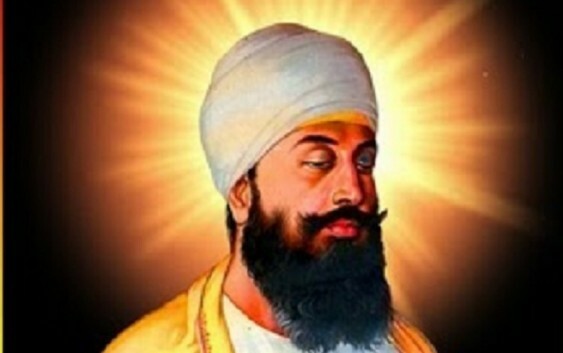 Guru Teg Bahadur set a remarkable precedent of martyrdom for the cause of freedom of religion (of any human being, irrespective of their faith), when he was publicly executed (beheaded) in 1675 on the orders of Mughal Emperor Aurangzeb in Delhi for resisting the forced conversions of Hindus in Kashmir to Islam, and after himself refusing to convert to Islam. For this sacrifice, Guru Teg Bahdaur is also known as Hind-di-Chaadar (shield of India.) Gurudwara Sis Ganj Sahib and Gurdwara Rakab Ganj Sahib in Delhi mark the places of execution and cremation of the Guru’s body. In March 1664, the eighth guru of Sikhs, Guru Har Krishan contracted smallpox. When asked by his followers as to who would lead them after him, he replied Baba Bakala, meaning his successor was to be found in Bakala. Taking the advantage of the ambiguity in the words of the dying Guru, many installed themselves as the new Guru. Sikhs were puzzled to see so many claimants and could not make out who the real Guru was. The Sikh tradition has a legend on how Guru Tegh Bahadur was found and chosen as the ninth guru. A wealthy trader Baba Makhan Shah Labana had once prayed for his life and had promised to gift 500 gold coins to the Sikh guru if he survived. He arrived in search of the ninth Guru. He went from one claimant to the next making his obeisance and offering two gold coins to each Guru, believing that the right guru would know that his silent promise was to gift 500 coins for his safety. Every “guru” he met, accepted the 2 gold coins and bid him farewell. Then he discovered that Guru Tegh Bahadur, who also lived at Bakala. Labana gifted Tegh Bahadur the usual offering of two gold coins. Tegh Bahadur gave him his blessings and remarked that his offering was considerably short of the promised five hundred. Makhan Shah Labana forthwith made good the difference and ran upstairs. He began shouting from the rooftop, “Guru ladho re, Guru ladho re” meaning “I have found the Guru, I have found the Guru”. In August 1664, a Sikh Sangat arrived in Bakala and anointed Tegh Bahadur as the ninth guru of Sikhs. The Sangat was led by Diwan Durga Mal, and a formal “Tikka ceremony” was performed by Bhai Gurditta on Tegh Bahadur conferring Guruship on him. In 1675, Guru Tegh Bahadur was executed in Delhi on 11 November under the orders of the Mughal Emperor Aurangzeb. No contemporary detailed accounts of the circumstances of his arrest and execution have survived either in Persian or Sikh sources. The only accounts available are those written about a 100 years later, and these accounts are conflicting. The Sikh historians record that Guru Tegh Bahadur had become a socio-political challenge to the Muslim rule and Aurangzeb. The Sikh movement was rapidly growing in the rural Malwa region of Punjab, and the Guru was openly encouraging Sikhs to, “be fearless in their pursuit of just society: he who holds none in fear, nor is afraid of anyone, is acknowledged as a man of true wisdom”, a statement recorded in Adi Granth 1427. While Guru Tegh Bahadur influence was rising, Aurangzeb had imposed Islamic laws, demolished infidel schools and temples, and enforced new taxes on non-Muslims. According to records written by his son Guru Gobind Singh, the Guru had resisted persecution, adopted and promised to protect Kashmiri Hindus. The Guru was summoned to Delhi by Aurangzeb on a pretext, but when he arrived, he was offered, “to abandon his faith, and convert to Islam”. Guru Tegh Bahadur refused, he and his associates were arrested. He was executed on November 11, 1675 before public in Chandni Chowk, Delhi. William Irvine states that Guru Tegh Bahadur was tortured for many weeks while being asked to abandon his faith and convert to Islam; he stood by his convictions and refused, he was then executed. The Sikh tradition states that the associates of the Guru were also tortured for refusing to convert, such as Bhai Mati Das was sawed into pieces and Bhai Dayal Das was thrown into a cauldron of boiling water, while Guru Tegh Bahadur was held inside a cage to watch his colleagues suffer. The Guru himself was beheaded in public.